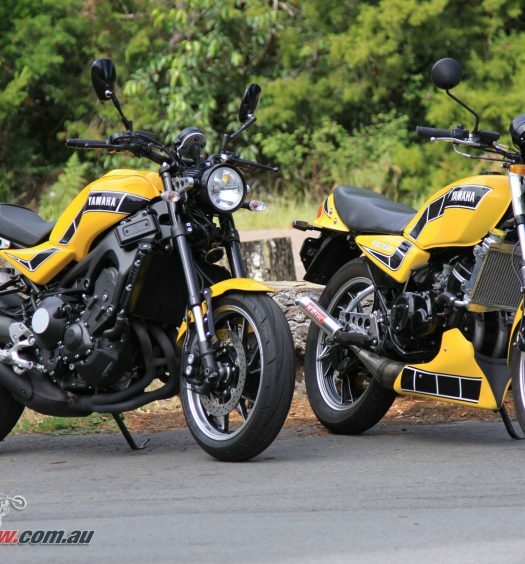 Doing a 3000km round trip to Phillip Island was a great opportunity to test Yamaha’s MT-09 Tracer in the twisties and the boring straight line, normally bum numbing, roads. At first sight, it looked quite big, but slipping into the saddle, combined with making a few of the available adjustments to suit me, the bike oozed comfort. The upright riding position is really comfortable and a stand out feature is just how narrow the bike is in the tank and footrest areas. These latter features contribute to being able to chew up kilometre after kilometre of straight line boring stuff in comfort, while making hanging off in the twisties a breeze. 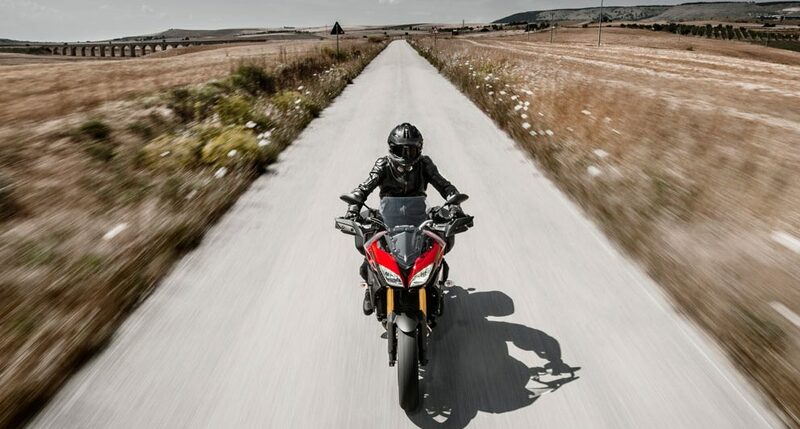 The bike can be set up to suit individual riding preferences, such as seat height, handlebars forward or rearward, rebound and preload for front and rear suspension and a choice of three riding modes developed specifically for the Tracer. The three modes are essentially are a sport mode, standard mode and what I would call tame. 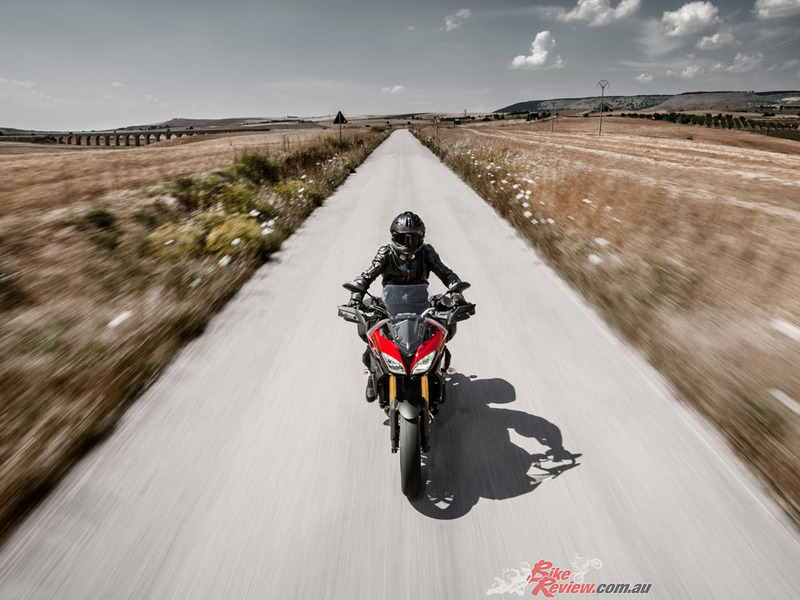 The Tracer is great on the long straight transport sections, not just the twisties. Having tested all three modes I settled on Standard for the remainder of the trip, which is what the bike defaults to each time the bike is switched off. For the road conditions covered, Sport mode was way too aggressive, with a particularly snatchy throttle at low speed and tame was too doughy, but I expect there could be conditions where this option would be wise. Even standard mode it is still quite snatchy coming off low throttle positions, which required extra care, particularly when playing on and off the gas in the twisties. My criticisms of the Tracer are limited to three and none would be a deal breaker. 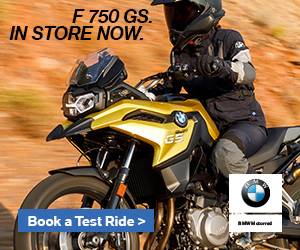 It is an amazing bike as is, then consider the price in comparison to similarly classed bikes. The throttle is too snatchy and would benefit from some refining and the handlebars are a little too wide for my liking. 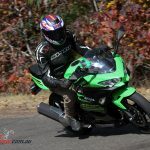 Finally, as aerodynamic as it is, side winds, particularly when tipped over during vigorous tight corner riding, seemed to upset stability a bit, but nothing dramatic and certainly nothing to worry about once you know it may happen. For the tourers out there, the Tracer has some very neat features. If you are switching between fully laden or solo, the powerful LED headlights can be adjusted to suit, without the use of tools. It also has a main stand which is a boon when fully laden and for maintenance, such as chain lubing and adjustment. 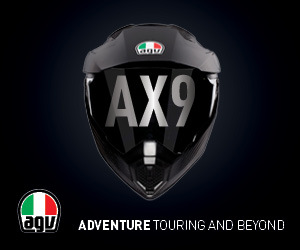 Again oriented to touring, the adjustable screen is extremely effective at high speeds and the standard hand guards are a dream in the rain to help keep hands dry and out of the wind. The bike comes pre-equipped with panniers and hence pannier mounts, which we did not test, but they don’t look out of place when panniers are not fitted. If you are carrying a pillion, the seat and footrest position will get top marks and if not in use, provides a valuable area to mount more gear. Handling, suspension out of the box and grip from the tyres never missed a beat even on the bumpiest of roads, with the traction control working quietly in the background. 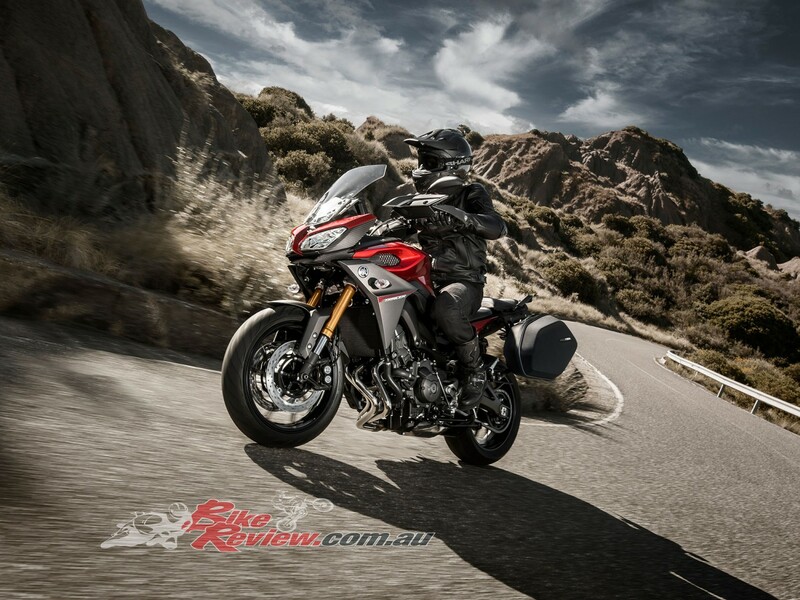 The Tracer’s power and torque is very impressive, particularly with the relatively low weight of the bike, with the triple engine providing a nice blend in between the torque of a V-twin and the power of a four. The engine is also remarkably tolerant of being in a normally too high a gear, with the bike accelerating smoothly, without bogging, from quite low rpm. The gearbox is smooth and positive to use, without a single missed gear on the trip. 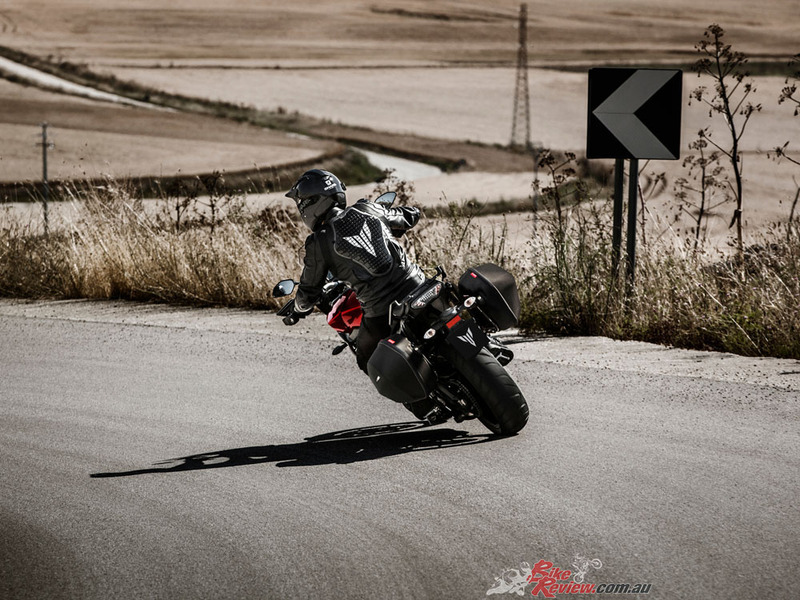 While outgunned by the bigger capacity sportsbikes on the trip in a straight line, it was not far behind and in the twisties, particularly when exiting corners, the Tracer more than held its own. Bottom line is it is a comfortable, very torquey bike, that will provide exhilaration during those sporty moments and will be an excellent tourer, one or two up over many kilometres, without frequent fuel stops. I did the 3000km kilometres over a few days and no standing up or leg stretching at all. The engine powering the Tracer is a liquid-cooled, four-stroke crossplane triple, with DOHC, four-valves per cylinder and a bore and stroke of 78 x 59.1mm. Compression ratio is 11.5:1. Peak power is 115bhp at 11,000rpm and torque peaks at 87.4Nm at 8,500rpm. 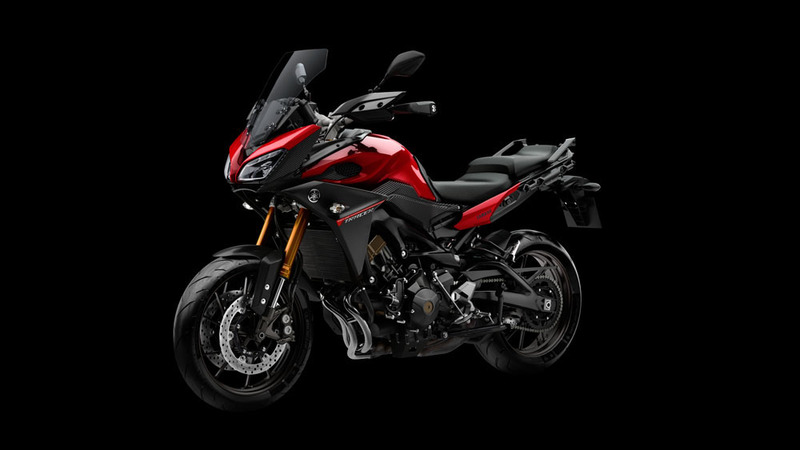 The engine plant is the same as the MT-09, with revised engine modes to suit the Tracer’s design and use. The engine technology includes fracture split con rods, forged pistons and offset cylinders, making this a compact and lightweight engine with smooth and linear torque. 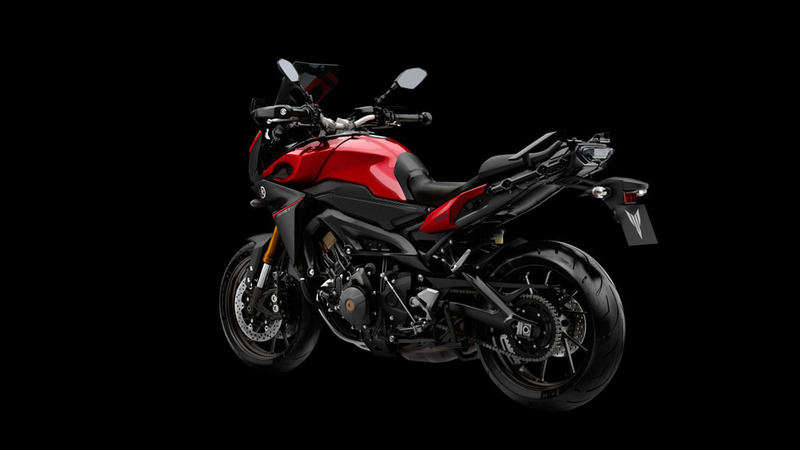 The Tracer features a lightweight control filled die cast aluminium chassis as used in the MT-09. The asymmetric swinging arm is also control filled die cast aluminium, with a near horizontal, adjustable preload and rebound shock absorber mounted under the seat, well out of way from grime etc. Travel is 130mm. Front forks are 41mm upside down, with adjustable preload and rebound. Wheel travel is 137mm. Front brakes are dual 298mm rotors. The rear is a single 245mm rotor. The Tracer features three D-mode (drive mode) options. In essence, a sport mode, a standard mode and a “tame” power mode. D-mode selection can only be performed when the throttle is fully closed and the owner’s manual warns that this should only be done when stationary. ABS is standard and cannot be disabled. Traction control is included and can be switched on or off only when stationary. Tyre profiles must meet original specifications for the traction control to function correctly. The ride position is upright, with adjustable seat height and two positions for the handlebars, including hand protectors. The front cowling is aerodynamic and combined with an adjustable windscreen provides excellent wind protection. Due to the swingarm being mounted externally to the frame and the knee indents in the tank, the footrest positions are narrow, thus providing excellent rider comfort. A multifunction LCD instrument panel displays RPM, gear, speed, drive mode, with push button scrolling between screens to show alternative parameters in addition, such as average fuel, consumption, current fuel consumption, trip meter and more. Twin LED headlights provide excellent lighting, with “no tools” adjustment to suit prevailing weight and its distribution on the bike. 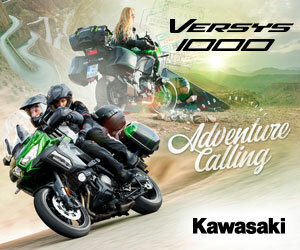 The bike is supplied with 19L panniers as standard in Australia. PRICE: $14,999 plus on road costs. 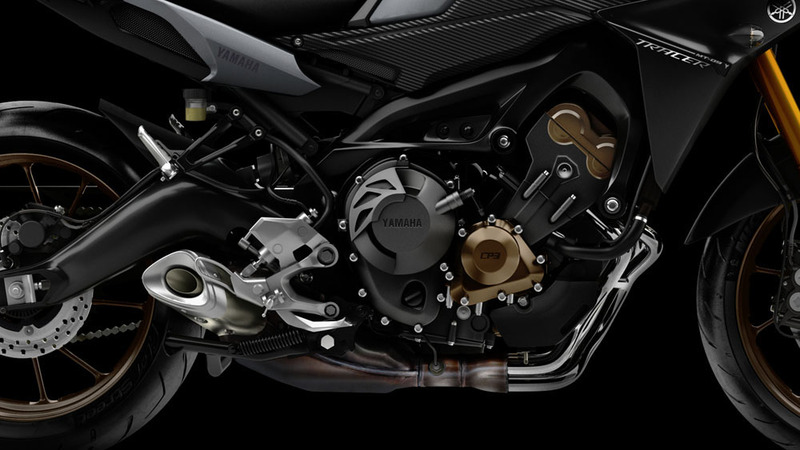 Engine: Liquid-cooled, crossplane triple, 12-valve four stroke, 78 x 59.1mm bore x stroke, 847cc, 11.5:1 compression, fuel injected with selectable three engine modes. Clutch: wet plate, multiple disc. Chassis: “Control filled” diecast aluminium diamond frame. Suspension: Adjustable 41mm upside down forks with 137mm travel, adjustable monocross type rear suspension with 130mm travel. Instruments: Multifunction LCD display, speed, RPM, average fuel consumption, current fuel consumption, gear, air and engine temperature, trip and total KM, mode, time, fuel gauge and other parameters. Akraprovic carbon/stainless full exhaust system. Just did 6000km on my Tracer, wrapped with the performance, handling and comfort. I’ve had a lot of bikes but the tracer is a great all-rounder. Looking at buying a tracer soon and have a query re luggage. I work away for three weeks at a time so need a bit of luggage carrying ability.At the moment I use a large top box and panniers and would like to know what the best set up is for the tracer for my normal riding plus extended trips. Yamaha do not recommend a top box and panniers but won’t say what the problem is,any suggestions. I like the hard cases for security. Be interested to hear your suggestions. 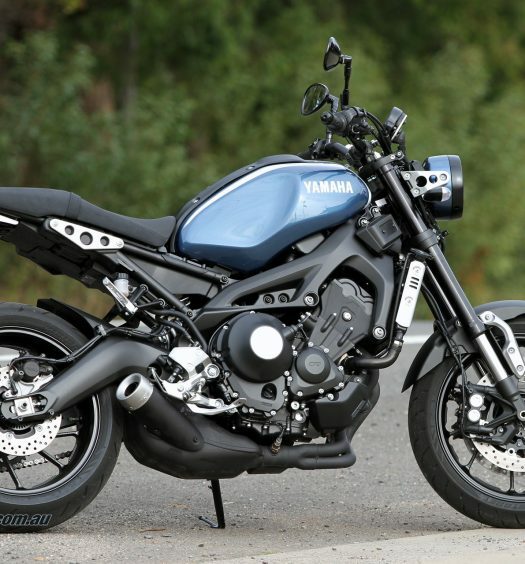 That’s an interesting question, I notice that Yamaha mention the possibility of the bike being overloaded with that luggage configuration, and they generally recommend only a low carrying weight maximum for most top boxes (it was 5kg when I had a genuine Yamaha set-up fitted to a FZ-06 years ago). At the time I know I carried much more than that many times, however that was a personal risk I took, and I know other FZ-06 owners were also able to carry above the recommended max. 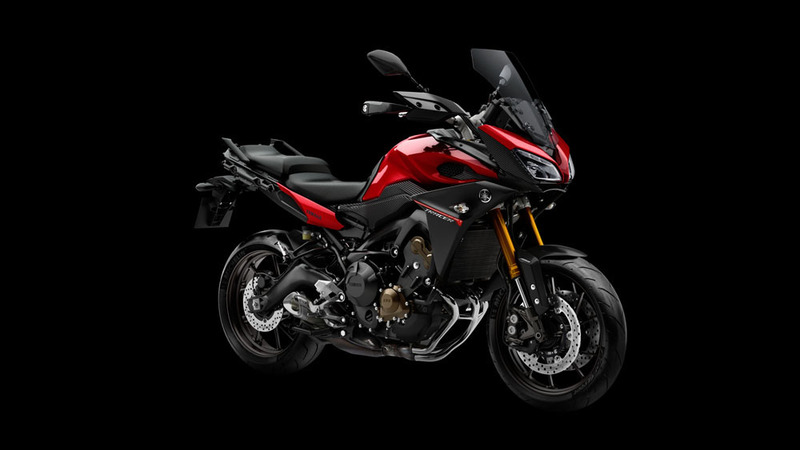 At the time it could also have an effect on the front wheel coming up, which would probably be even more noticeable on the MT-09, with the torquey triple. 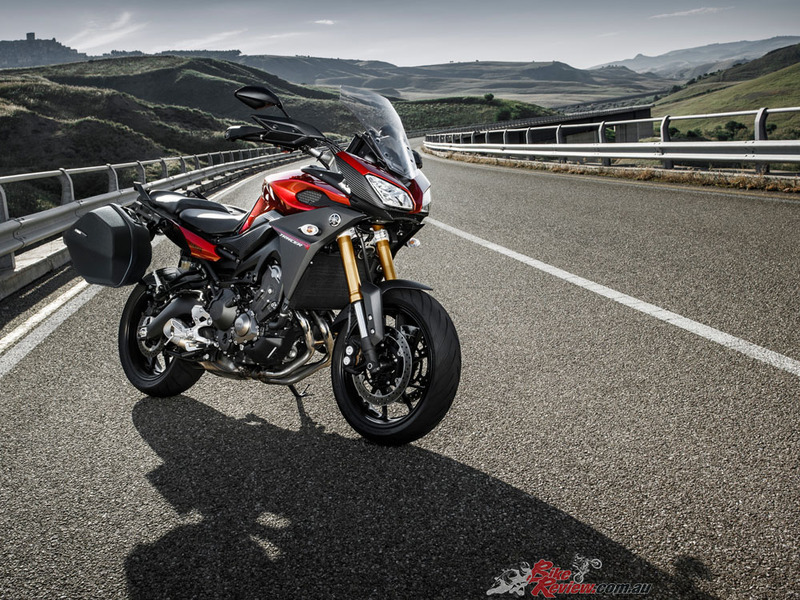 Just speculating here, but with both the panniers and topbox it’s possible there’s a similar consideration, especially if you’ve got a pillion on board, of exceeding the MT-09 Tracer’s recommended maximum weight or putting too much strain on the subframe. 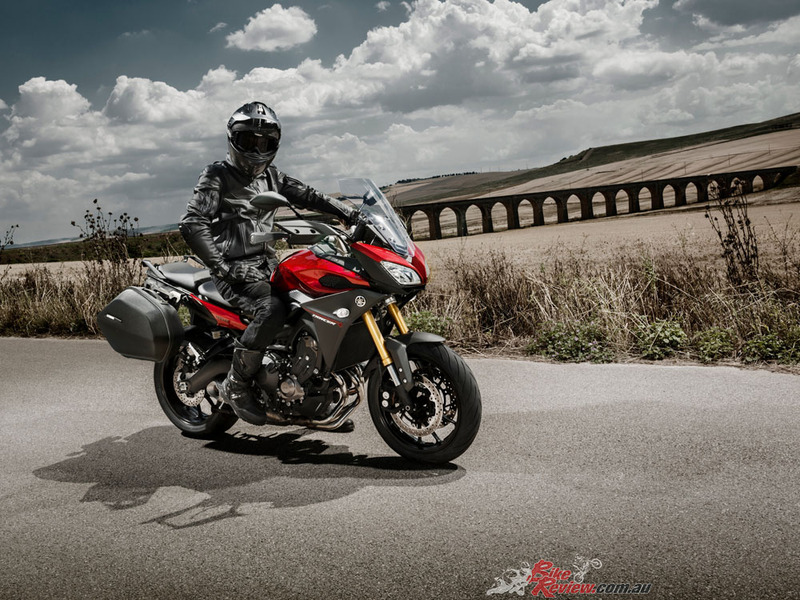 To me this would be a great tourer for the 4 -5000km trips I take each year, to Tassie for 3 weeks, but I take a fair bit of luggage, so no top box and panniers together is a deal breaker for me. Would an aftermarket rear shock help with this? There’s reasonable adjustability within the stock shock, so you’ve got some room for personalising the settings there, however many bikes will benefit from an aftermarket shock built to a rider’s specific needs. We don’t imagine the topbox/pannier recommendation is rear shock related though if that’s what you mean.